Ana Faggi, Buenos Aires. Jürgen Breuste, Salzburg. Environmental perception by people is complex and dynamic. Individuals are active agents in their perceptions of nature—not passive receivers of information—while the environment is a global unity on which environmental processes within cities are based. Cognitive, interpretive and evaluative components are all incorporated into the perceptual processes of individuals. The world we perceive is a world created by ourselves through our experiences, which reflects our expectations, needs and goals. Gibson, in his environmental perception theory, asserted that objects are perceived according to the meaning, action and behaviour involved and not according to the physical characteristics they possess. All of this influences how we plan, design and manage our cities. 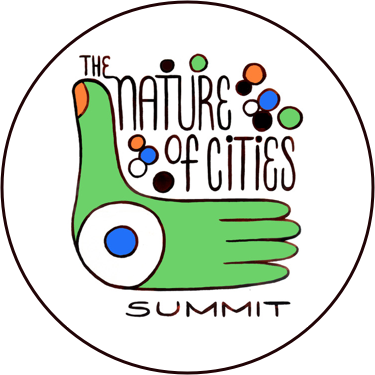 Many Nature of Cities posts call the attention to the relevance of green and blue infrastructure in densely built-up areas, representing a win-win way to conciliate urbanization with the protection of ecosystems services. The success of reconnecting people to their nearby nature will hang principally on people´s values. Riverscapes are attractive places not only because water is one of the most important aesthetic elements of the landscape, but because of the many native plants and animals that occupy the shore. As Wilson asserted in his Biophilia theory, we all have an inborn affinity for other forms of life. At the same time, since the beginning of the last century architects, designers, planners, psychologists and researchers interested in environmental behaviour have consistently reported the presence of water as one of the most important and attractive visual elements of a natural or built landscape. The attraction exerted by the rivers and their banks are explained by the “Hydro- and Biophilia” theories (Wilson (1984) . This human preference is ancient. Settlements have always been located near water because of the resources that water offer for life. Waterscapes attract tourists, may be distinctive urban icons and have cultural significance to residents binding them to their local landscapes. At the same time—unfortunately—urban settlements have long considered riparian areas as marginal places, disregarding their intrinsic environmental values. That is why such native habitats became progressively altered, fragmented or disappeared. Environmental perception is remarkably relevant to river management. It has been shown, for instance, that wetlands that are highly valued for their appearance are more likely to persist over the long-term in a human-dominated landscape. In management it is therefore fundamental to examine local residents’ environmental perceptions about urban streams in order to create appropriate and efficient designs. 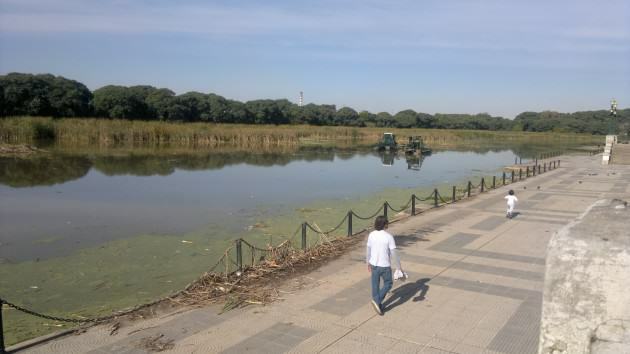 In Buenos Aires there are three main water courses and 14 other smaller rivers and streams that drain into the Rio de la Plata estuary, most of which have been greatly modified. 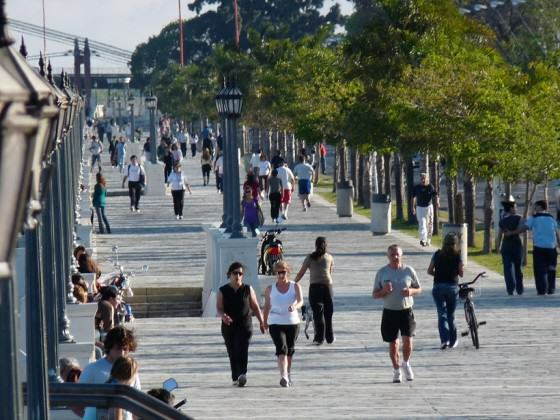 The Rio de la Plata waterfront is a main urban attraction, very crowded on weekends. More than seven hundred questionnaires through personal interviews with visitors to the waterfront and coastal residents in 2009 endorsed the predilection for nature and water among other landscape features. While the estuary is the most important, other neighbouring streams, which still harbour biodiversity, are neglected, losing their appeal because of contamination problems that began 40 years ago. People stopped using streams as recreational and places for contemplation, as they were often used as dumping grounds. In 2013, opinions and attitudes of three hundred interviewed adults living along one of those polluted streams showed a widespread perception of poor environmental quality across the watershed. The way in which respondents valued and perceived watercourses was highly influenced by what they saw or smelled. Adults generally thought streams were polluted by effluents and waste, and somehow dangerous due to crime. Results showed that a lonely riverbank that is littered and vandalized may be frequently mistaken as unsafe by passing residents, who associate such places with alcohol or drugs abuse. Interviewed adults did not value watercourses for their wildlife or scenery and did not use them for recreation. Worse, some women proposed that streams be culverted underground, removing them from surface view! An absolutely different message was given by the young people living along the watershed. In the above mentioned study we explored their views and desires concerning the river quality. 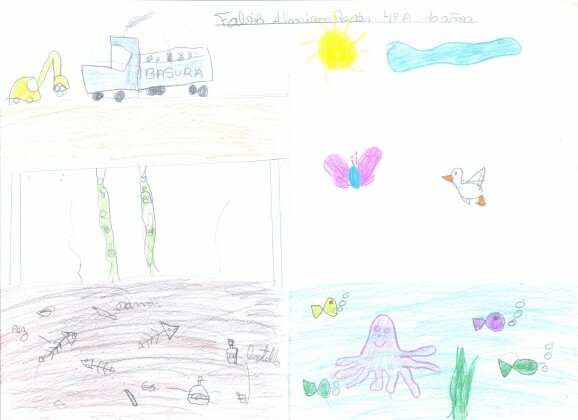 Almost four hundred young people of 10-15 years old were interviewed and asked to draw how they saw the river today and how they would like it to see in the future. Young people believe nature is very important and irreplaceable for their daily lives. Although right now they are aware and preoccupied about the environmental state of the river, they see possibilities to improve the environmental situation in the future, regardless on which sector of the basin they live and their social-economic status. 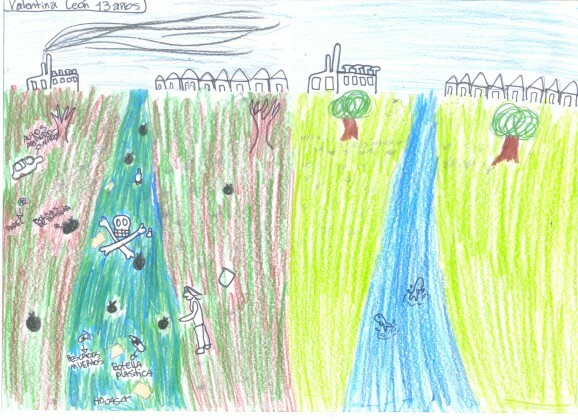 Fabio, ten year old, sees the river in the future as habitat for nature. Are these optimistic young people’s views based on the fact that kids are traditionally very fond of natural places such as rivers and streams as places to play, rest and come together, developing their own individual understandings of those environments? Or, do these results confirm the influence of the current Millennial Generation (Y Generation), convinced that they want to overcome current political and economic hurdles; adjusting their lifestyle to the ecological challenges of our time? If the latter is so, urban nature by the hand of a unified “green”-oriented and civic-minded generation should have a promising future ahead. because we love our river, our river to share. Because we’re family, don’t you know? And this river will always be all of our home. Wilson EO (1984) Biophilia, the human bond with other species. Harvard University Press, Cambridge, 157. 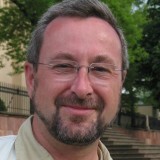 Dr. Jürgen Breuste is Head of the working group Urban and Landscape Ecology at the University of Salzburg, and founding President of the Society for Urban Ecology (SURE). This is a very interesting post on the perceptions of young people on the environment. One of the questions that concerns me is whether environmental education re-affirms the dualistic understanding of city/nature, culture(humans)/nature, which is understood by many as the basis of our environmental crisis. Children and young people are not outside of society and their ideas and understanding about nature are shaped by all sorts of people (parents, friends), media (movies, music, books), places, etc. (that is, they minds are not ‘clean’). 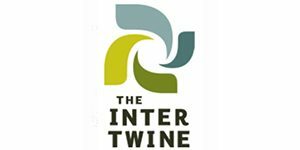 So while many children and young people worry about the environment, are they creating alternative understandings of nature that will lead to more ecological and socially just worlds? Thank you for your comment. I agree with you! !